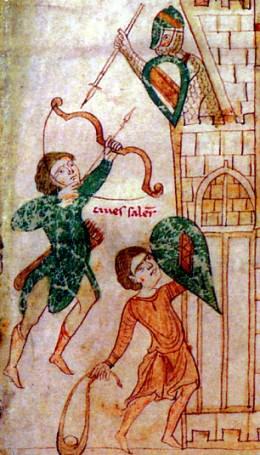 During the first phase of their Southern Italian conquest, the Normans included archers in their troops; but such usage seems to have been sporadic and simple. The tactic called fleindriva, of Viking origin, was employed in such battles as Civitate; but some records leave us to think that these were not professional archers. Instead it appears that they were simple foot soldiers recruited from the native populations and equipped [in case of necessity with…] with the necessary bows and arrows. This is confirmed by episodes at the Palermo siege and Battle of Durazzo. During the siege of Palermo (1071) Robert the Guiscard armed his infantrymen with bows and slings with which to shoot the Arabs that were attempting a sortie. According to Anna Commena, the archers that accompanied the Norman expeditionary force in Epirus were just young striplings and decrepit old men, recruited from every part of Southern Italy, and they did not have any knowledge of handling a bow. In early twelfth century Southern Italy, as in the rest of the Continent, crossbowmen were being increasingly used in place of archers. But an important exception to this was represented by the presence of Muslims, whose culture contained a strong archery tradition, in the Norman-Swabian armies. The Normans, soon after the conquest of Sicily was complete, began using Sicilian Saracen mounted and foot archers as auxiliary troops: in 1076 they were included in the Guiscard army at the seizure of Salerno; in 1091, they followed Count Roger to besiege Cosenza; in 1094 to Castrovillari; in 1096 to that of Amalfi; in 1098 the strong army of the Count that crossed the Messina Strait was composed largely of Saracens. From 1130 King Roger II used pedites saraceni in his Royal Guard during the fight against rebellious nobles, in order to sustain the foundation of his Regnum Siciliae. Fredrick II reinforced the use of Saracens in Southern Italian armies. After having put down the last of the rebellions in Sicily he deported to Lucera, in Puglia, the most troublesome Saracens who had refused to convert. Here the Emperor founded a flourishing Arab colony, which continued their traditions and customs for about a century, as well as the right to practice their own religion.